The Revelstoke Snowmobile Club has been keeping the local trails in tip-top shape for nearly five decades. According to the club website, this organization is a signing partner on a trail management agreement with the government and a signatory of a stewardship management agreement with the Ministry of Environment. They also have a memorandum of agreement for Boulder Mountain and Frisby Ridge, which they hold in partnership with the Ministry of Tourism Culture and the Arts. 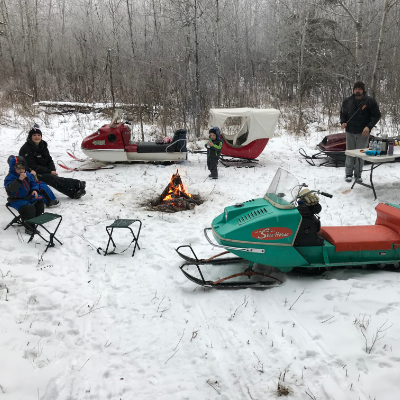 We wanted to highlight this wonderful organization and give our readers all the basic information they need to contact the club, purchase a membership and otherwise get involved in the Revelstoke sledding scene. What are the club's top trails or riding areas? How do you get to the staging areas? Boulder Mountain: Turn right off Highway 1, just west of the silver bridge at the lights. Travel on Westside Road to the Boulder parking lot. Frisby Ridge: This area can be accessed via the Boulder parking lot by taking Streeter Street to Frisby Ridge. Sale Mountain: This trail has a staging area that can be accessed 18 kilometres north of Revelstoke on Highway 23. Parking on the highway is limited, so please use caution. Keystone: This staging area also has limited parking and can be reached by travelling 52 kilometres north of Revelstoke on Highway 23. Area 51: Area 51 can be accessed by taking Highway 23 South, turning right just before you get to the ferry. From there, go down the logging road for approximately five kilometres to the log dump. Mount McCrae: Mount McCrae is located 20 kilometres south of town. Follow Airport Way south (on the east side of the Columbia River), approximately 18 kilometres to the end of the road. Hall Mountain: To get to this area, drive 40 kilometres south of town on Highway 23. Parking can be found off the road on the west side or at the Shelter Bay junction. From there, just take the logging road that leads right up the mountain. Wap Lake Road: This riding zone is located eight kilometres west of Revelstoke. To get there, turn left at the top of the three-lane hill, which can be found about two and a half kilometres west of Three Valley Gap. Are the trails plowed regularly? Some trails are kept groomed, while others are left ungroomed. To find out which areas are plowed at any given time, check out the club's grooming reports. You can also look at the riding areas section, which gives information on each trail and its typical maintenance. Do trail fees apply to all trails and riding areas? If so, how much are the trail fees? There is a $20 per day trail fee to ride Boulder Mountain and Frisby Ridge; it is collected at the trailheads. Yearly memberships are also available, which include trail passes and other benefits. How much is an annual club membership? 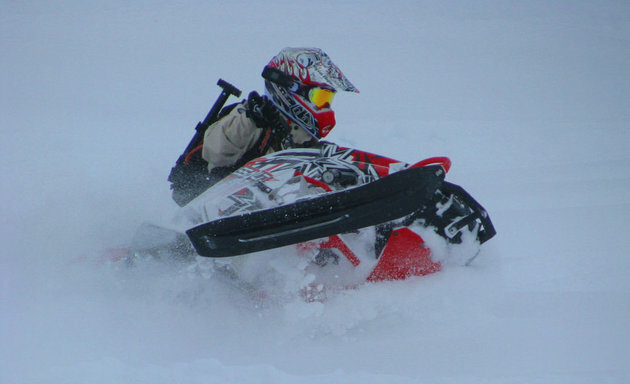 All memberships include a membership to the British Columbia Snowmobile Federation (BCSF)—even the non-rider. Check the club's membership page to keep track of the latest information on joining. Are there any cabins or warm-up shelters in the area? There are two spacious, well-equipped day cabins constructed and updated by the club members. One is on Boulder Mountain and one is located on Frisby Ridge. What are the club's annual events and when do they usually take place? There is an avalanche awareness day in January, a youth day in February, and then the annual vintage ride, the Snowarama Snow Drags and a ladies ride, which all take place in early spring. If people want more information about the club or the area, who can they contact? 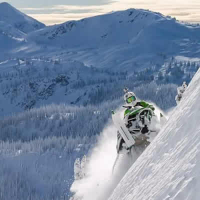 Visit the Revelstoke Snowmobile Club's website or Facebook page. 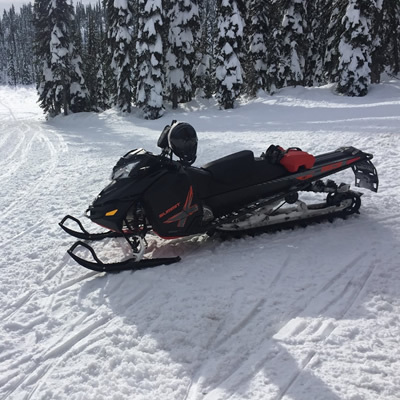 Trail maps, top snowmobile trails, club contacts and other useful information you can use before planning a snowmobile trip to Revelstoke, B.C.